Prototype: Five (5) different German Federal Railroad (DB) standard design main line passenger cars. The cars look as they did in Era IIIb such as when used on the Höllental Railroad. Three (3) type Bie standard design passenger cars, 2nd class, one (1) type ABiwe standard design passenger car, 1st/2nd class. One (1) type Pwie standard design baggage car. 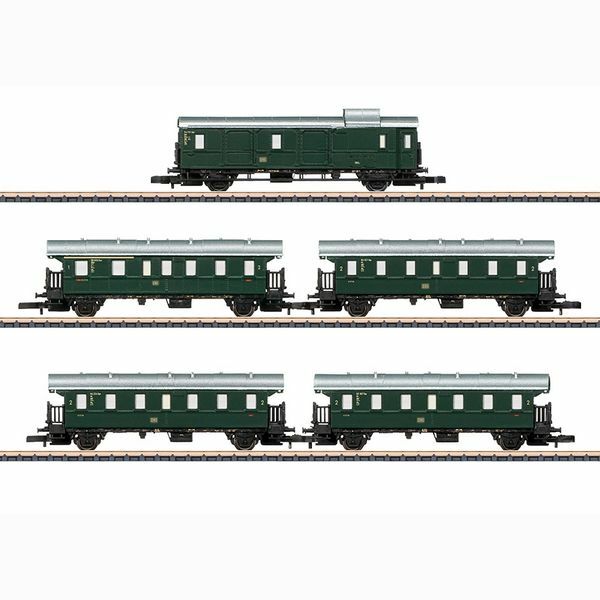 Model: This set consists of five (5) different passenger cars, finely painted and lettered. All of the cars have their own car numbers. These models are not available individually. Total length over the buffers approximately 320 mm / 12-5/8".